Khalid Kamau Wins So. Fulton City Council Seat in Landslide! 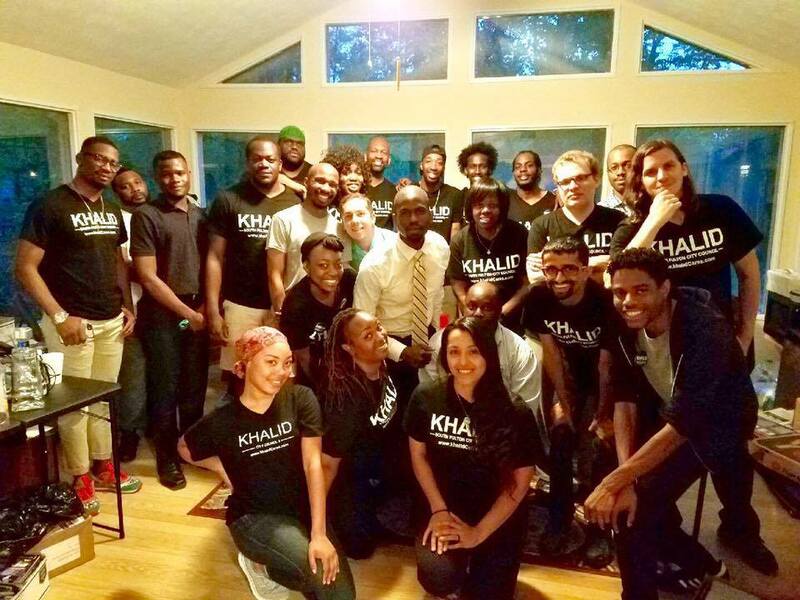 Khalid kamau, a Democratic Socialists of America (DSA) member and endorsed candidate for City Council in South Fulton, Georgia (center in photo), won in today’s election with 67 percent of the vote. Kamau defeated Charlean Parks, who finished second in the five-way primary race on March 21st. In addition to DSA, he was endorsed by Our Revolution, Teamsters Local 728, and Street Groomers. Khalid is a co-founder of the Atlanta chapter of Black Lives Matter and a labor organizer for the Amalgamated Transit Union. As an active member of Atlanta’s Neighborhood Planning Units, he helped develop a neighborhood watch program and negotiated on behalf of his community in development projects. Khalid is also active in environmental justice and LGBTQ rights advocacy. Khalid is the second DSA member to win local office this month. Dylan Parker was elected to Rock Island, Illinois City Council as 5th Ward Alderman on April 4th. There are now 14 DSA members holding public office, including Carlos Rosa, Chicago’s 35th Ward Alderman; Mike Sylvester, of the Maine House of Representatives; and Julie Ann Nitsch, Austin Community College Board of Trustee in Texas. Khalid was born and raised in the City of South Fulton, GA, until going to school in Ithaca College, New York. He chooses to use lower-case letters for his name as an homage to his Yoruba roots — it shows a stronger tie to the community than to the individual, a sentiment echoed in his activist work and community outreach projects.